UCA Theatre degree programs lead to the Bachelor of Arts in Theatre or the Bachelor of Science in Theatre. Students seeking the baccalaureate degree in Theatre must complete forty (40) semester hours of theatre and related coursework. A minor requires twenty-six (26) hours. The program offers a wide range of courses in acting, directing, dramatic theory and history, and various aspects of technical production. The UCA Theatre program focuses on the stage where classroom knowledge is applied in hands-on training and experience. These degrees require completion of 124 hours including a general education component, specific degree requirements (B.A. or B.S. ), and a minor as arranged through the student’s minor advisor. In order to help students grasp the importance of historical and social traditions which created and continue to sustain theatre as an art form, UCA Theatre Program works hard to plan ahead by selecting different genres throughout history. 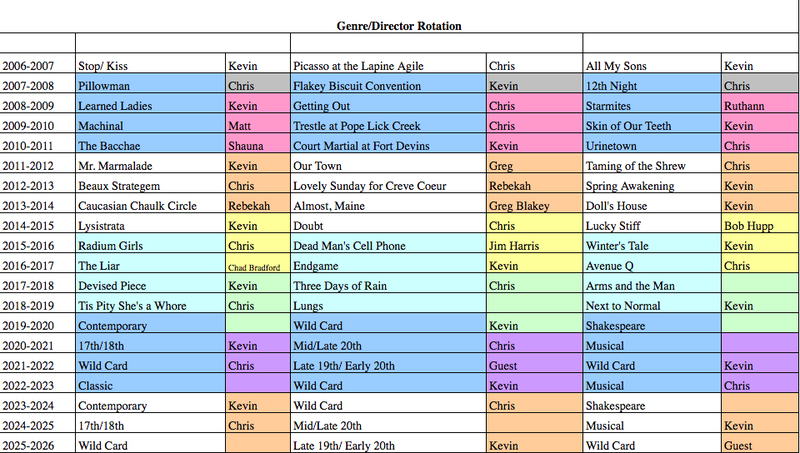 Below you will find our genre and director rotation guide. This will help you get a sense of the broad productions we feature. UCA Theatre is committed to providing students with unique learning experiences. In addition to learning from our own talented faculty and staff, students have the opportunity to work with well-known guests artists and designers. The UCA Public Appearance Series schedules numerous touring companies throughout the year presenting a wide range of events including concerts, dance companies, and theatrical presentations. UCA Theatre is an accredited institutional member of the National Association of Schools of Theatre. This accreditation assures students and parents that the UCA Theatre program meets professional standards in theatre education and training as set fourth by the association.